KAMPALA – The Archbishop of Tororo, Dr. Emmanuel Obbo, A.J, has said the province is ready for the June 3, Martyrs Day Celebrations at Namugongo indicating that about 4 million local and foreign pilgrims are expected. Addressing a press conference at the Catholic Secretariat in Nsambya on Wednesday morning, Archbishop Obbo who will lead this year’s celebrations said pilgrims were expected from Tanzania, Kenya, DR Congo, Nigeria, Malawi, the Europe and USA. “We are expecting millions of pilgrims from within Uganda and from all over the world. 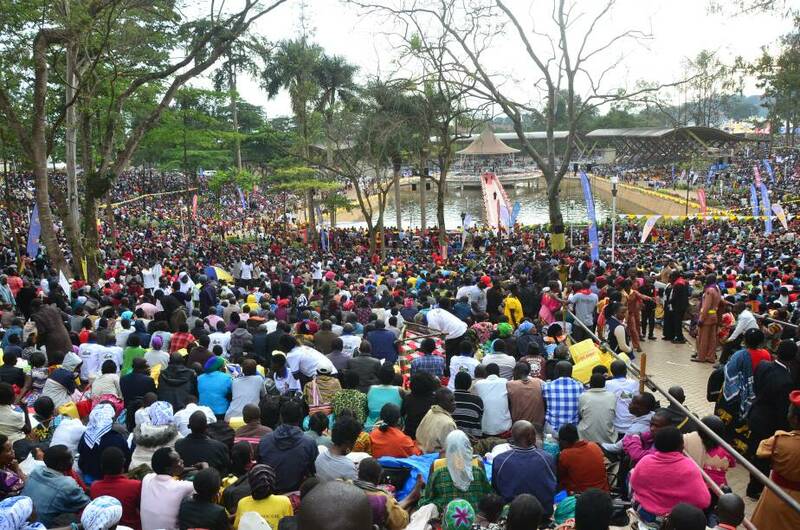 The Archdiocese of Tororo has already registered about 7,000 pilgrims and Uganda Catholic Secretariat has received notifications from Malawi, Tanzania, Kenya, South Africa and Nigeria,” he said. Archbishop Obbo said the Walk of Faith, jointly being organised with the Uganda Tourism Board will take place on Saturday May 12 from the Martyrs Shrine in Munyoonyo, to St. Matia Mulumba in Old Kampala. He also announced that the special novena for Uganda Martyrs will start on November 25, and end on June 2. Msgr. J.B Kauta appealed to the public to come to Namugongo and respect it as an area of prayer. “Don’t come to Namugongo to drink beer, but to pilgrimage and pray,” he said. June 3 is observed in Uganda for the commemoration of the Uganda Martyrs Day in remembrance of the 45 Christians killed by the Kabaka of Buganda. The 22 Catholic Martyrs were canonised as saints 52 years ago. My dear brothers and sisters, I greet you in the name of the Lord. Last year, I announced to you that the Archdiocese of Tororo was chosen by the Uganda Episcopal Conference to organize and animate the 2018 Uganda Martyrs day celebrations at Namugongo Catholic Shrine. We are now left with only one month to the 3rd of June and I am glad to update the public about the preparations for this great event. A committee known as the “Kampala Chapter” headed by Mr. Robert Kamiza was also set up consisting of members from Tororo Ecclesiastical Province who are living in and around Kampala area. Tororo Ecclesiastical Province covers the dioceses of Jinja, Kotido, Moroto, Soroti and Tororo. The above named committees have teamed up with members of Uganda Catholic Secretariat in Kampala to constitute the National Central Organizing Committee under the Chairmanship of the Secretary General of the Uganda Episcopal Conference, Msgr. John Baptist Kauta. This national committee is coordinating with the Government of Uganda and the various stakeholders to make the Uganda Martyrs day celebrations a success. We are expecting millions of pilgrims from within Uganda and from all over the world. The Archdiocese of Tororo has already registered about 7,000 pilgrims and Uganda Catholic Secretariat has received notifications from Malawi, Tanzania, Kenya, South Africa and Nigeria. We expect confirmations from international pilgrims in their thousands in the month of May, as we draw closer to the day. Our total resource requirements for the preparations and celebrations is projected at UGX 720,000,000/= (Seven hundred and twenty million shillings only). Several fundraising activities have been held in Tororo, Kampala, Entebbe and other places. We have so far raised about half of the required amount and yet we have barely a month left. I appeal to you all here present, our listeners and viewers to support this celebration in honour of our martyrs. The success of Tororo is indeed our success as Ugandans. An official Souvenir Magazine is being prepared for the occasion and it will have information about the life of the Uganda Martyrs, special messages, and the proceedings of the day including the Order of the Mass with the hymns and readings. Institutions and individuals who would like to advertise in this magazine can contact the Social Communications Department of Uganda Catholic Secretariat or call our Editor Mr. Alex B. Atuhaire on 0776-499122. As communicated last year, the Archdiocese of Tororo has chosen the following theme to guide us in the celebrations, “LET US WALK IN THE LIGHT OF GOD AS A FAMILY” (1 John 1:5-10). This theme ultimately focuses on the Family, also referred to as the domestic Church. It is the smallest unit of the human society in which the Faith of everyone is implanted and in which it grows, drawing from the powerful example of the parents. In the Archdiocese of Tororo this entire year is running along the sub-theme of “MERCIFUL PARENTS, PEACEFUL FAMILIES”. All our pastoral programmes are inspired by it. The Martyrs we are honouring came from families and some of them were Family heads. There is no doubt that their Martyrdom had an impact on their families. They shared in their pain but also benefited from the Faith which has been passed on to us. 2.The indispensable role of the Catechist in the evangelization and sustenance of the Family. The Catechists are our immediate pastoral agents at the grass-root where they get in touch with the Family unit and sustain its faith. 3.The Young People (Youth) who constitute the majority of the population in Uganda, are a treasure to the Church and they need our care, love and guidance. A special prayer has been formulated and is being recited in all the parishes and chapels of Religious Houses in Tororo Archdiocese invoking the Almighty God, our Blessed Mother Mary and the Uganda Martyrs to bless our plans and the preparation efforts. On April 21, 2018, our committee in Kampala organized a Children’s Walk of Faith at Uganda Martyrs Catholic Shrine in Namugongo, where our children and youth made a pilgrimage to strengthen their faith. I would like to thank Rev. Fr. Paul Masolo, the Rector of St. Mary’s National Major Seminary, Ggaba, who represented me as Chief Celebrant. I also appreciate the organizers who tirelessly worked to make the event a success and all the media that covered the event. In collaboration with Uganda Episcopal Conference and Uganda Tourism Board, the Archdiocese of Tororo is organising the 2018 Walk of Faith on Saturday, ….May 2010 along our central theme — “LET US WALK IN THE LIGHT OF GOD AS A FAMILY” (1 John 1:5-10). As we are focusing on Family, our Youth will be the central feature in this year’s Walk of Faith, and our Archdiocesan Youth Chaplain together with the National Catholic Youth Chaplain are mobilizing the youth to participate in big numbers. This is a one- day pilgrimage from Munyonyo Martyrs shrine from where the story of martyrdom started to St. Matia Mulumba Church in Old Kampala. It is a symbolic walk and spiritual journey to enable our Christians today to experience the Martyrs’ pain and last moments on earth. This year’s walk will be the third such official event to be included on the Uganda Martyrs day celebration calendar intended to promote Uganda Martyrs trail. I encourage all of you to come and participate in big numbers. There will be a novena prayer through the intercession of the Uganda Martyrs at Namugongo Catholic Shrine from May 25, 2018 to June 2, 2018. A novena is a nine days of public or private prayer made in preparation of a feast or for special graces. I encourage all the Catholic faithful in Uganda to observe this novena as we prepare ourselves spiritually to our heroes in the Faith. a) I extend my sincere gratitude to all the members of the Central Organizing Committee and the various sub-committees for their tireless efforts to coordinate the activities of the preparations and to fundraise for this event. b) I thank the Uganda Catholic Secretariat under the leadership of the Secretary General Msgr. John Baptist Kauta for guiding us. c) I appreciate the Archbishop of Kampala His Grace Cyprian Kizito Lwanga, who has allowed us to fundraise from the parishes in the Archdiocese of Kampala. d) I greatly appreciate the Government of Uganda and its various organs for the support. e) I thank all our Christians, friends, the various institutions and individuals, for the support and generosity shown in the preparations so far and I invite all to walk with us through this journey up to the day of the celebrations. f) I commend the members of the press and all the media institutions for always being with us and covering our events. May our Blessed Mother Mary and the Holy Martyrs of Uganda intercede for us as we prepare for this important celebration. Most Rev. Emmanuel Obbo, A.J.